Home > technical	> Live Instructor, Or Live Code? Live Instructor, Or Live Code? 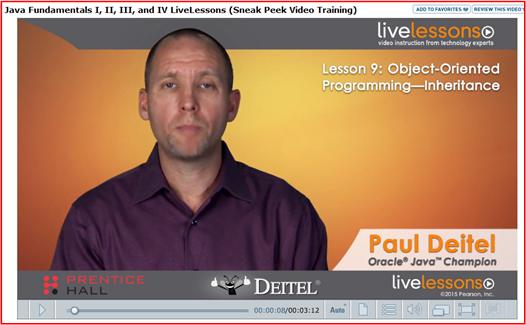 I’m currently taking an in-house course on Java programming. The material is being presented in standard lecture fashion where the instructor sequentially walks through a series of static powerpoint slides and explains what the code snippets on each slide are doing. Other than in the lesson video intros (e.g. the one above), you never see Mr. Deitel on the screen. 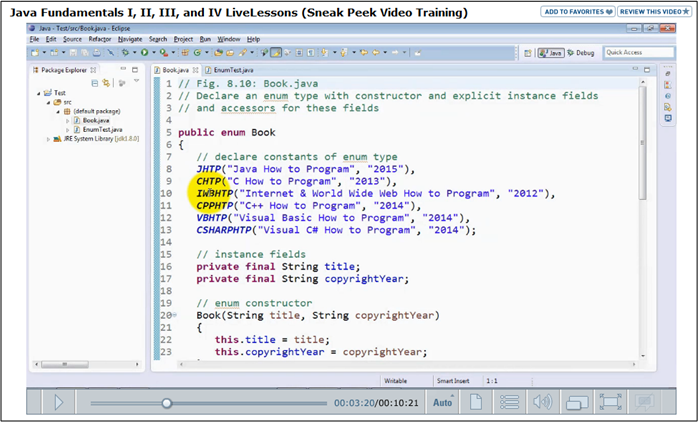 Like many educational videos you can watch for free on YouTube and Kahn Academy, you see code and a yellow circle highlighter that Paul dynamically steers around the screen as he explains what the code is doing. You can see the instructor dynamically interacting with the IDE (in this case Eclipse). You can learn at your own speed by replaying lesson snippets that you didn’t fully grasp the first time. (I’m not so smart, so I use this feature all the time). The instructor can compile/run the code in front of your eyes and connect the code with its output by switching between the console and the code editor as needed. The instructor can intentionally insert bugs in the code and step through the debugger. 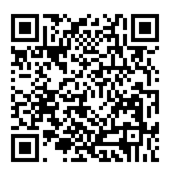 The instructor can switch between the code and detailed online documentation as needed. Regarding this particular course, I’m thrilled with Mr. Deitel’s work. He’s very thorough, shows great empathy for the student, and he dispassionately points out the differences between Java and C++ as they emerge throughout his code examples. Centralized garbage collection (I prefer C++’s RAII idiom and smart pointers for localized garbage collection). The fact that all methods are virtual by default. The fact that every user-defined reference type inherits from class Object. The fact that a whole other layer of software, the JVM, sits between user code and the operating system. The fact that Java” steers” programmers toward designing deep, complicated inheritance hierarchies regardless of whether that style fits the application. Regarding the last point, the mental steerage toward a pure OO programming style is subliminally catalyzed in the way that the JDK library packages are designed and the proliferation of large frameworks in the Java community. The obsession with deep hierarchies reminds me of Microsoft’s horrendously complicated old MFC framework for writing Windows GUI applications. I’ve personally seen the effects of a fixed OO mindset in Java programmers who subsequently learn and write C++ production code in my domain: distributed real-time event systems that are naturally “flat“. The code ends up being overly complicated, hard to understand, and very few methods in the deep trees end up being called. The end result is that the “smoothness” of the language is nullified, developer time is wasted on unnecessary code, and the code is hard to maintain.